Cork is durable, warm, decently priced and 100% renewable. It’s made from bark harvested from oak trees. That’s right, no cutting trees down to make this house flooring type. It’s soft and muffles sound which is great if you live in a multiple story home. Cork is one of several house flooring types that can snap together to make a floating floor. No need to glue the planks down. And it can sit above concrete or even existing flooring. A great option if you have an unfinished basement. You will need to install a cork underlayment underneath. However, cork is an easy flooring to install. Laminate has long been a popular alternative to hardwood floors. It’s one of the lowest maintenance flooring choices out there. Easy to clean and extremely durable, laminate resists scratches, nicks, damage, and fading. Vinyl tile is one of the best kitchen flooring options on the market. It’s also popular in laundry rooms, baths, foyers, and mudrooms. Vinyl tiles come in 12×12-inch squares in a variety of colors, textures, and styles. You can be bold and create a checkerboard design or put in a contrasting border. In just one day you can refresh your space and add some color. Vinyl flooring is DIY friendly. Floating vinyl sheets don’t need to be glued or stapled to the subfloor. Just click into place. Because of the size, many homeowners find 12×12 tiles easier to work with than planks. If you are hoping to do several home improvement projects on a budget, vinyl tile is a great way to save money. Another of the best home flooring options you can get to warm up your toes is carpet squares. It’s not a good idea to try to install wall to wall carpet on your own. The cuts have to be precise and can ruin the entire roll. But, you can quickly carpet any room in your house with carpet squares. Carpet squares come pre-cut to about 20 in. sq. You don’t have to nail the carpet squares down to the subfloor. Little sticky dots on the corners connect the squares together. You get warm and soft carpet that floats over your existing floor. Best of all, if you get a stain on a section, you can rip up those squares and put in new ones. There are so many color options available with this easy flooring. You can mix and match as many colors and patterns as you like to design a unique floor. Carpet squares are perfect in basements and bedrooms. Linoleum has come a long way since the retro flooring you remember from your grandma’s kitchen. Nowadays, linoleum is modern, easy to install and best of best of all, doesn’t contain any VOCs. In fact, linoleum is made of all natural materials such as wood flour, pine rosin and solidified linseed oil. You can get linoleum that mimics stone tiles and hardwood. 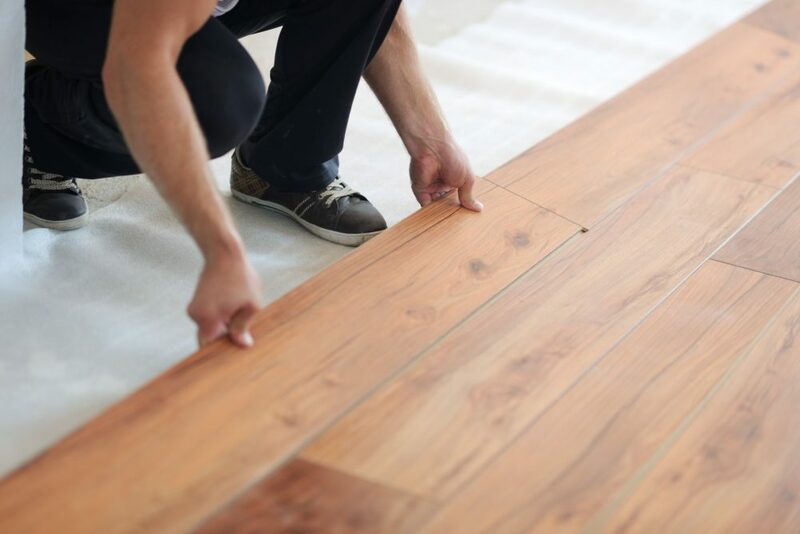 It’s an easy flooring to install and is one of the lowest maintenance flooring options around. There you have it! 5 easy flooring options you can install in your home yourself. Whether you want soft and warm or durable and quiet, there is a flooring option for your needs. Next, check out these home remodeling ideas that won’t cost a fortune.